Progress is a fairly new concept. If we took one of the Egyptian pharaohs from the third millennium BC and dropped him 4,000 years into his future, in London or Paris of 1776, he would have been amazed by many things, but only a few of them would have been beyond his comprehension. Among those exceptions would have been the magnetic compass, gunpowder, and the telescope. With some explanation and observation, however, he would have quickly grasped the concepts behind other ‘advanced’ items of the day, such as the printing press with movable type, the pendulum clock, and the large sailing vessel. In contrast, if we were to transport one of the US founders a mere 240 years into his future, into our world today, he would be terrified by a myriad of technologies completely beyond his comprehension, and he would only understand what he was seeing after years of explanation and study. Among those bewilderments would be airplanes, automobiles, helicopters, television and movies, maglev trains, antibiotics, cardiovascular surgery, neurosurgery, electric lights, central air and heat, hot and cold running water, nuclear power, holograms, motion detectors, the electric stove, the microwave, submarines, the aircraft carrier, ceramic knives, computers, desk-top printers, four-color printing, plastics, 3D printing, international telecommunications, space travel, robotics, a multitude of domestic and industrial machines, canned food, and year-round fruits and vegetables, which constitute but a few. These two considerations are actually a rich source of table conversation. I invite the intrigued reader to add items below that would have been incomprehensible to either Ramesses in 1776, or George Washington today. The point is, for the first 10,000 years of civilization progress was largely a goal of bigger and more complex, while technical, commercial, governmental and social advances were infrequent, and generally serendipitous. In the last 240 years however, progress has become a rapid succession of ideas and sciences and technologies. As I have worked here to point out, creationists and Darwinists alike can agree on small evolution. From that agreement, we can see that humanity has changed in important ways, as evidenced by the pygmy, the Mongol, the Inca, and the Swede. Whoever our first ancestors were, we have become different from them, and we have biologically adapted to our world today. Correction: we have biologically adapted to our world in the past. 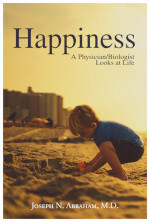 Small evolution fashioned our ancestors, which means that our bodies are selected to earlier times. When the world changes, particularly when it changes as fast as it does today, it takes time for our bodies to catch up with our learning. Nature will increasingly lag behind nurture. This is the problem we face. For 10,000 years, a conservative approach – staying with traditional practices while exclusively focusing on bigger and stronger – has been the superior strategy. Actually, it was pretty much the only strategy. So our bodies and brains were adapted, not simply to conservatism, but to a reflexive, and unreflective, conservatism. I have emphasized that conservatism is essential, and that it constitutes most of what we do. If we are not overwhelmingly conservative in our activities, then progress has no stable base upon which to build. That part is easy. The hard part is learning to be open-minded as to what can be changed, and from there, to consider what we need to change in order to remain competitive. Before we struggle with one another, we first need to struggle with ourselves. We need to learn to listen more to our head, and less to our gut. This is why functional definitions of liberal and conservative are critical. We have argued over liberal and conservative for so long1)Consider that the ideas of ‘left’ and ‘right’ emerge after the French Revolution of 1789, hot on the heels of 1776. – with the assumption that one side or the other is fixed, immovable, and unequivocally true, while the other is nonsense – that we miss the critical interplay. The title of this post, ‘Changing Change,’ may seem odd to the layman, but the scientist and the engineer immediately understand what it means. Change is motion; changing change is acceleration. The world isn’t simply changing, the change is changing, the rate of change is growing every year. The trick is to decide when to be which. Liberal always carries a risk. But as the world changes, rigid conservatism carries yet other risks. In the marketplace and in the military, we all understand balancing tradition and innovation. We just need to understand that the same tension applies to all of life. We need to be neither liberal nor conservative. Because screaming about it just leaves us, our children, and our nation behind. Front page illustration courtesy of Wikimedia.org. 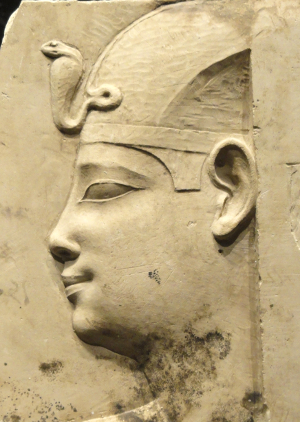 Bas relief of pharaoh’s head courtesy of Nelson-Atkins Museum of Art via Wikimedia.org. 1. ↑ Consider that the ideas of ‘left’ and ‘right’ emerge after the French Revolution of 1789, hot on the heels of 1776.